More than ever, the Cedar Springs FFA is giving their students many opportunities to learn by doing. The FFA motto, “Learning to Do, Doing to Learn, Earning to Live, Living to Serve,” is especially held true as the members work together with older mentors. One great opportunity is the Maple Syrup Project. The members work alongside FFA boosters Steve Schmidt, Dave Dunaven, Rick Sevey, and Randy House; the high school’s kitchen crew; and many others. These boosters are entering their third year of showing members how to use a forest to produce a very profitable and desired product. When working to complete this product, the workers must complete the following steps: Start by washing the buckets, next tap the trees and hang the buckets. Members must go out and collect sap every day when the weather is right. After all of the sap is collected, it is time to boil. Boiling time will be greatly reduced this year, due to a reverse osmosis process that FFA booster and alumni Rick Sevey created. 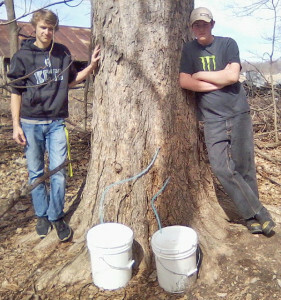 So far this year, the Cedar Springs FFA has collected over 1,600 gallons of sap, which is nearly half of their yearly haul last year. Along with the Maple Syrup Project, they also manage a project called the Land Lab. Committee members work to raise crops, which they later sell to help fund the chapter. They also put the money towards buying new equipment to keep the project running. The Land Lab is located on nine acres of land broken into two sections near the middle school and high school. The members grow corn and soybeans on the land. A portion of the land is also reserved for a community service project called the Community Garden where members provide garden plots for use by the community. Project Land Lab is supported by the community members, FFA boosters, and alumni. They help by mentoring the committee members, providing equipment and its operation and often give feed and fertilizer donations to support the project. As a part of the “Learning to Do” experience, FFA members plan fundraisers to raise money and a greater awareness of their program. The middle school and high school FFA programs got together to raise money on February 27. Their chapter sold meat sticks, homemade maple syrup, and baked goods to the public. These specific fundraisers were sponsored by Tractor Supply Co. and Family Farm and Home, whom are two big supporters of the FFA Chapter. Not only does Tractor Supply Co. support FFA in their fundraising, but they also offer a grant program to help with projects such as the community garden area. During the Spring the FFA prepares garden plots for the community. This Spring, the chapter is focusing their work around the motto “Learning to Do.” With the help of community mentors and boosters, the FFA members will gain new knowledge on agricultural tasks such as making maple syrup or learning to plant crops. The FFA motto is just one way the chapter will achieve its mission of premier leadership, personal growth, and career success.